The law of cosines is used to finding missing sides and angles of triangles. More information on types of triangles. In fact, the pythagorean theorem is actually a special case of the cosine rule where the angle is 90 degrees and the form is SSS. Amazing! 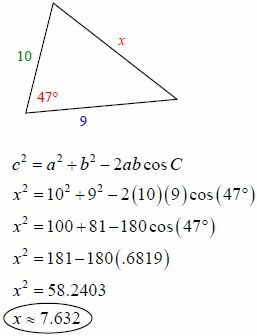 Evaluate the cosine of an angle using the cos function. Understand the naming conventions for triangles (see below). First, you must understand what the letters a, b, c and A, B, C represent in the formula. The corresponding letters (a & A, b & B, c & C) represent the side and the angle across from it. Please see the figure below. Note: the letters used are arbitrary. As long as you match the side with the angle across from it, the formula will work! The formula is listed in two forms: the standard form (used for sides) and a derivative of the standard form which makes it easier to colve for angles. Remember, to solve for an angle, you will eventually need to use the inverse function!